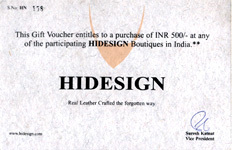 Hidesign Gift Voucher is valid only in India. Hidesign Gift Voucher is valid for 6 months from the date of issue. This Gift Voucher cannot be exchanged for Cash. Locate outlets of Hidesign . . . . . .
HIDESIGN follow traditional methods of manufacture and tanning, that reflect a care for the craftsman, craftsmanship and the environment using processes which have long since disappeared from the modern leather industry. The leather is full grain cowhide, vegetable tanned and hand dyed. The art of tanning HIDESIGN leather is by the time honoured traditional method of soaking the hides for forty days in extracts of bark and seeds collected from the forests of Africa and India. Only after these vegetable extracts have been fully absorbed as vegetable oils, applied to make the hide supple. Only solid brass buckles are used, each individually sand cast and hand polished, reflecting old saddlery traditions. Traditional methods to produce products which are rich in character, texture and individuality.